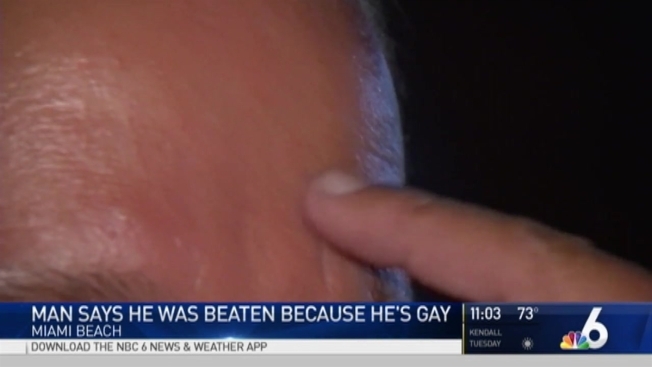 A man says he was beaten on Miami Beach because he's gay. The people allegedly responsible are still on the run. A man is recovering after being attacked on South Beach Friday night. Miami Beach Police say Kenneth Wilcox was walking his dog Friday night on 14th Street and Meridian Avenue, when two men walked past Wilcox and one allegedly made a racist remark to Wilcox. Wilcox told police that he passed out and then regained consciousness three hours later. When he went to the hospital the next day, he was told that he had internal bleeding, fractured ribs and a concussion. Wilcox told police that the two men were black. One was 6’1” to 6’2”, about 160 pounds with a shaved head. The second man is about 5’9”, about 160 pounds, also with a shaved head. Both were wearing jeans and t-shirts. If you have any information on this crime, you’re urged to call Miami-Dade Crime Stoppers at (305)471-TIPS. You can remain anonymous.